Dr Halliday Sutherland produced Britain’s first public health cinema film. The film, The Story of John M’Neil, is available through the good works of the British Film Institute. You can view the film (free of charge) by clicking here. This dramatised account of the experiences of a Scottish family devastated by tuberculosis is believed to be the first British health education film. Ill-ventilated slum tenements, such as the one shown here (the “Tuberculosis Nest”) were breeding grounds for the deadly disease. The film offers practical guidance as well as a message of hope and was widely shown across Britain, usually accompanied by a lecture. 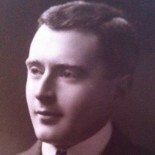 The filmmaker, Halliday Gibson Sutherland, was a British doctor and author. He researched and wrote widely about tuberculosis and in the year he made this film he founded a tuberculosis clinic and an open-air school for children – like the one featured in this film – in the bandstand of Regent’s Park in London. Unfortunately, for licensing reasons, the film is only available for viewing in the United Kingdom. This entry was posted on 24 April 2018 by markhsutherland in Consumption, Films, Open-Air School, Scotland, Tuberculosis.